One of the easiest ways to keep the data on your iPhone X safe is to back up on iTunes. It is easy because it is easy to accomplish; all you have to do is to connect the iPhone to the computer and sync with iTunes. Restoring the data on your iPhone when you need to is just as easy and requires very little as well. And because data loss can be very swift and devastating, having an iTunes backup is one of the best things you can do to keep your data safe. That doesn’t however mean that iTunes doesn’t have its own shortcoming. There are a few nonnegotiable (we think) problems with backing up and restoring data via iTunes. And while we will share with you a way to overcome these problems, we can’t do that without first of all sharing what these problems could be.They include, but are not limited to the following. You are unable to see the backup file’s contents and as such cannot choose which files to restore if you just need some and not all your data back. If you need a better, faster and more effective solution to restore your iTunes backup to iPhone, you need to consider the services of iMyfone D-Port Pro. It is a tool that is made to help you overcome all the problems an iTunes backup and restore process can bring. Some of the features that make this possible include the following. 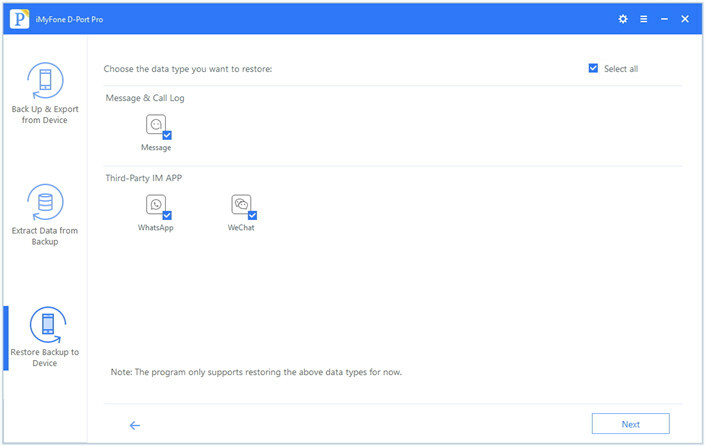 D-Port Pro allows users to restore just messages, WeChat or WhatsApp data from their iPhones. 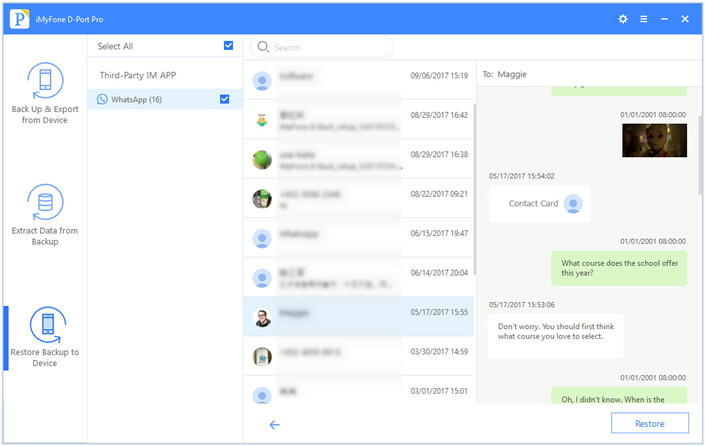 It is also very effective in restoring partial backup of the data on your device without overwriting all the other data on the device. Both backup and restore process can be accomplished in a single click. It is also ideal when you need to export any data from your iPhone, iCloud or iTunes backup to your computer. To begin, download and install D-Port Pro to your computer, launch the program and then follow these very simple steps to restore your backup. Step 3: The program will then begin scanning the backup for the data types you selected. The whole process will not take too long. Once it’s complete, preview the data you chose in the next window and select the ones you’d like to restore. 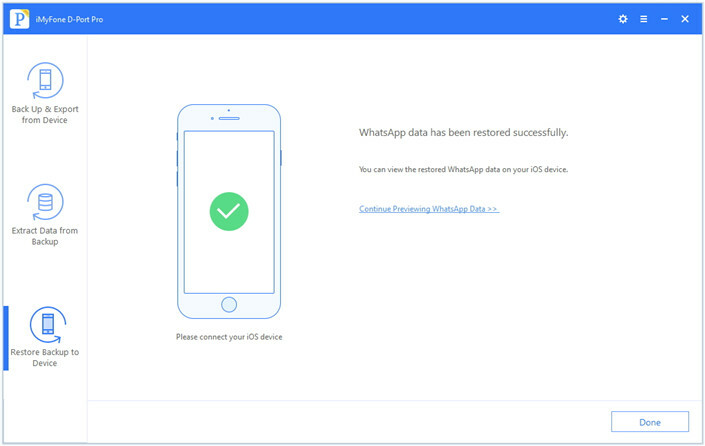 Step 4: Now Click “Restore” and the program will begin to restore the data to the iPhone without affecting the rest of the data on the device. After restoring, you can view and use the WhatsApp messages on your iPhone X.